Photon Energy Systems is India’s leading solar desalination plants manufacturers . We manufacture Solar Desalination Systems using TiNOX - MAGE MEH Desalination Method. We offer customized, pre-engineered containerized desalination solutions. Due to increase in saline water and scarcity of fresh water sources, solar desalination plants are in great demand. 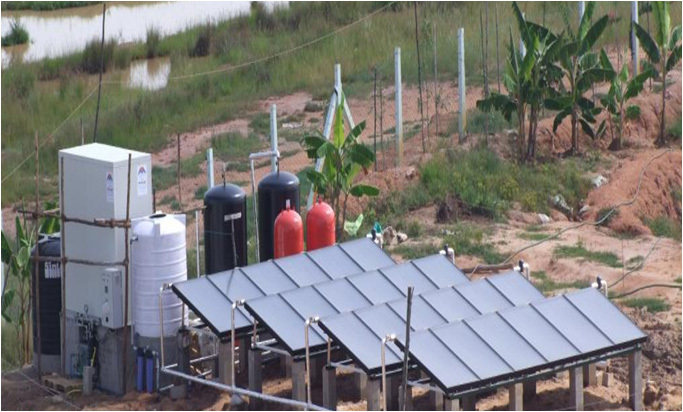 Our solar desalination plants are widely appreciated by our clients for their easy installation, excellent performance & low maintenance..
Our product portfolio includes myriad of solar energy solutions namely, PV products, thermal products and power plant solutions. An increased utilization and proper harnessing solutions would ensure a cleaner environment. We, at Photon Energy Systems, are committed to manufacture and supply of high quality solar power products. We are a recognized leading solar energy company in India, specializing in high efficiency PV module manufacturing and comprehensive power-plant solutions. We look forward to providing green energy to all. We, at Photon Energy Systems, incorporate Multi Humidification Effect technology to carry out desalination of the saline water. This technology is so effective that it produces fresh water in its second-purest form, free of any bacteria or any other organic contamination. We aim to create the best customer experience and be recognized as the best desalination plants manufacturers. Copyright © PhotonSolar.com. All rights reserved.